Take a look at how you can light up your living space in the best way possible! Our living room design ideas are here to kick-start your next decorating project or mini update. You could be looking for a way to liven up your lounge or restyle a sitting room. And we know exactly how to create a comfortable space where the household can relax, however much you have to spend. Here’s the right lighting for your space! Atomic light pendant by DelightFULL is a modern design interpretation of the atomic age, inspired by the composition of the atom. Building this unique lighting design using materials such as brass, steel, and aluminum, DelightFULL’s skilled artisans arranged it in an abstract composition, very similar to the non-conventional molecular forms. Both a glossy black and a gold-plated finish were used for the body, while glossy black and gold powder paint were the chosen finish of the shades. This stylish suspended ceiling light is the right fit for a contemporary living room, or even for a more modern master bedroom. Coleman is the ideal mid-century modern floor light to be placed next to any 1950 modern furniture piece as your industrial office couch or desk. The 1 light manageable head floor lamp with matte black and matte white accents has a simplistic and sleek design featuring a black textile cord and a flexible shade. With a classic shape making it fitting for not only Scandinavian style homes, but this brass floor lamp will also fit perfectly in every single home design style. Inspired by the iconic mid-century era, Hank suspension light brings a graceful, organic shape to any room. Perfect for a mid-century modern interior, this lighting design offers the open look that is a great choice for today’s demand for a stylish interior. 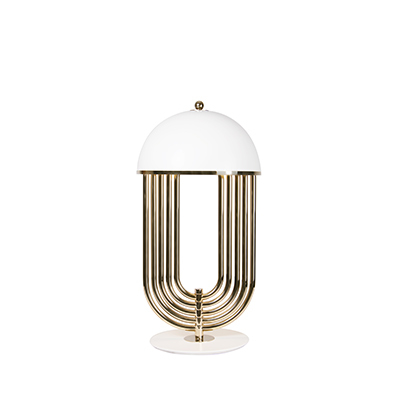 This dazzling lamp has its body in brass and its shade in aluminum. Its stunning telescopic tube has 27, 5″ | 70 cm and its body is gold plated as its shade with black matte makes this an irresistible selection. When it comes to décor, this marvelous and inspiring piece is highly recommended in a mid-century hotel lobby or living room. Matheny wall light has a complex and attractive geometry design of combined tubes. This unique lamp combines a mid-century modern design with a classic style that will make a statement in your home. Providing a subtle glow, this modern wall light is 100% handmade in brass and has a brushed nickel finish. With 4 lamps, we recommend you to use G9 bulbs. Ideal for your industrial kitchen or to use as a bedside reading lamp, Matheny wall light will add a smooth lighting effect to every single room of your interior design.